The back beat to these lovely pursuits was the ever-present Disco boom-boom-boom of filling the shelves with soaps and balms and teas and herb blends, in preparation for shows beyond our regular scope. We barely lifted our eyes from our work. And then, just like that, it was August. The 70's rock revival of summer. This is the beauty of perennial herbs and food plants. They just don't care! The one plot, where I usually plant vegetables is fenced in. It is now full of foxtails, chicory, and ragweed, taller than me. A couple of the borders, where the perennials grow, are basically out of control. Next year, we'll start early and dig up the wild berry vines, mulberry seedlings, small sumac trees, and pokeweed that the birds have planted and our neglect has nurtured. It will be work, but we'll get it back. 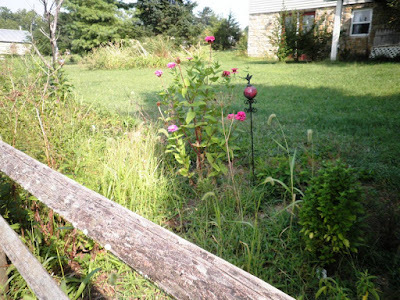 There were a few annuals that we took care of, but other than an occasional mowing and pulling back the weeds to gather specific herbs, we've been lazy gardeners. And still... it keeps going. The beat goes on. We've been picking the ripe elderberries each evening, and freeze about a quart every day. They'll continue to ripen for another couple of weeks. 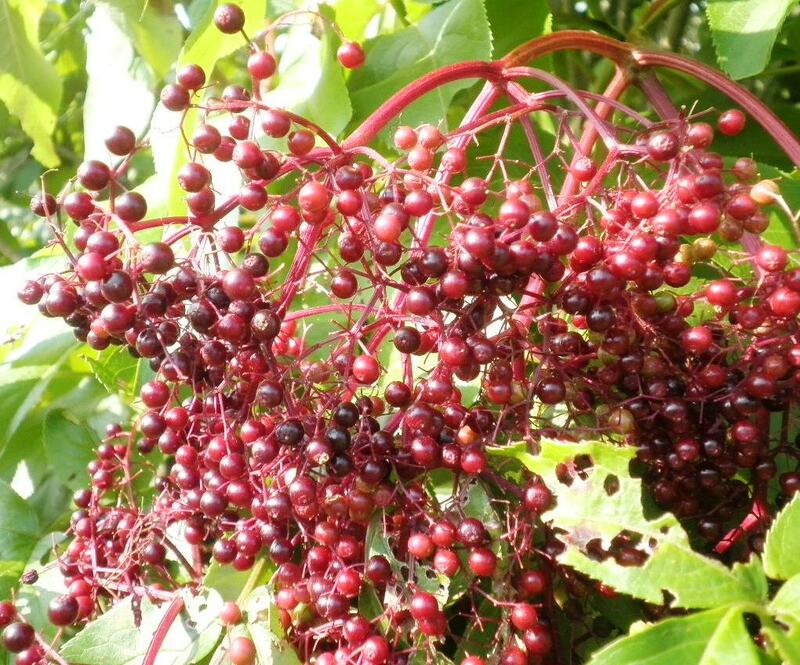 The stems deepen, the berries turn to dark, almost black garnet orbs, and with each day our fingers remember better exactly the pressure required to roll them from their stems. The persimmons are hanging heavily on the branches. It is with regret that I must report that the groundhog living under the deck keeps trying to develop an affinity for the unripe fruit (freak!) and climbs the tree to grab them. Of course they are inedible at this point, so s/he leaves them on the ground with a single bite gone. Molly's boneset patch is vibrant. 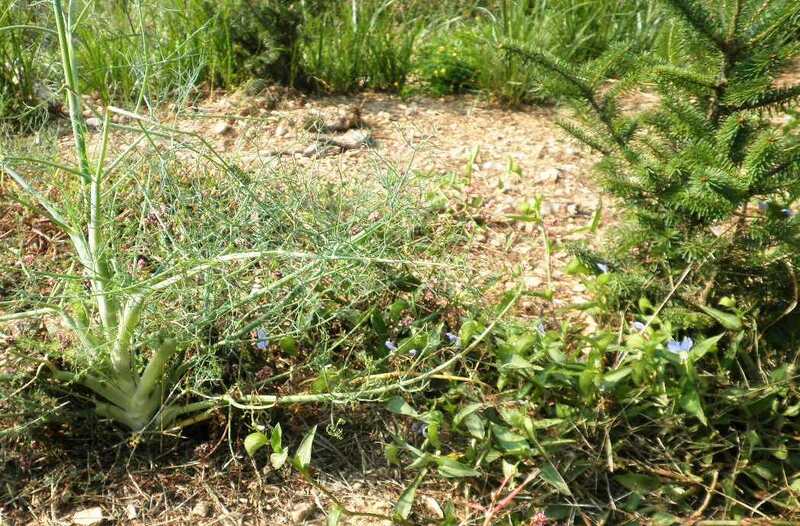 baby tree, fennel, baby tree, fennel. Cha cha cha. 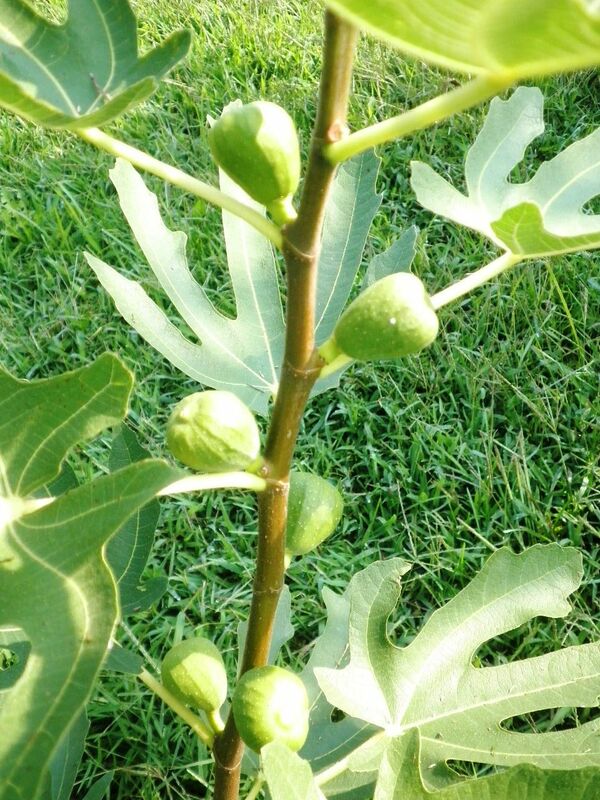 The fig trees have both recovered from the severe nibbling they took over the winter. Will they ripen before frost? I don't know, but hope for a few. Horehound. That is one tough plant! 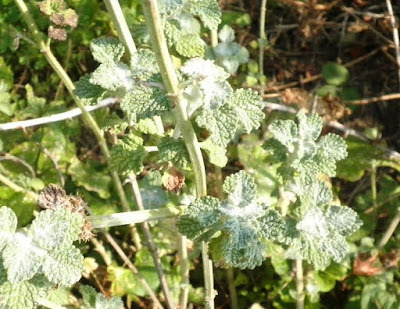 All sorts of field weeds try to take over the space in which it resides, and horehound is having none of it. No sir. Growing like a weed. The passionflower vines have gotten very comfortable, sprawling around the corner, and holding hands with the sour cherry tree. Some afternoons, I can smell the intoxicating scent of the blossoms halfway across the yard. The flowers will open later today. 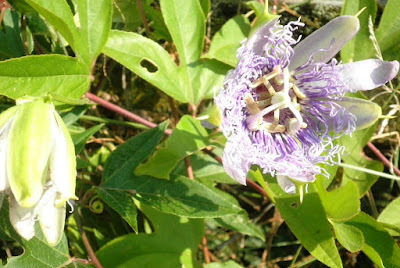 The passionflower is also beginning to set fruit. So far, none has ever ripened for us. Maybe this year? We'll see. Our white vitex (not as pretty as purple, but very strong) died down to the ground over the winter. That was a first. For a while there, I thought maybe it would be an opportunity to replace it with a purple one - but before I turned around twice, it was 5 feet high and blooming to beat the band. 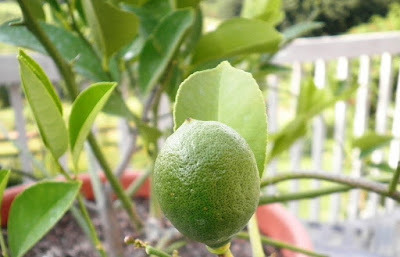 And of course the Meyer Lemon. This year I've found that dusting the leaves and stems with diatomaceous earth has really helped with scale, aphids, and ants. All of those things are drawn madly to the blooming plant, and then each other. Most years I have to completely repot it before bringing it in, as ants nest in the soil - but no problem so far this year. There are still a few things around the front of the house, like California poppies, mallow, echinacea, and a few straggling cornflowers. In the back, the horseradish is lush and tall, and soon we'll harvest a few roots for fire cider. The witch hazel is huge, and I picked a bunch of it a couple weeks ago to distill our own hydrosol (turned out great). Still, the tempo has mellowed and quieted, as if in response to the changing quality of light. Just as the plants take note and start to shift gears, so do we. Soon, we'll visit the beach for a true goodbye to summer, and then it will be autumn. A little waltz of final preparations for the lullabye of winter. A few weeks ago I had a dream where eyebright (Euphrasia) made an appearance. It was kind of odd to be honest. I have had dreams about herbs before but I usually have a reason. I have been studying them or working with them or I’ve grown certain affection for them. Eyebright showed up in the middle of an otherwise mundane dream and basically said, “Notice me, woman!” So I did. Afterward I asked my family and a few friends about the plant and I was surprised by what I learned. 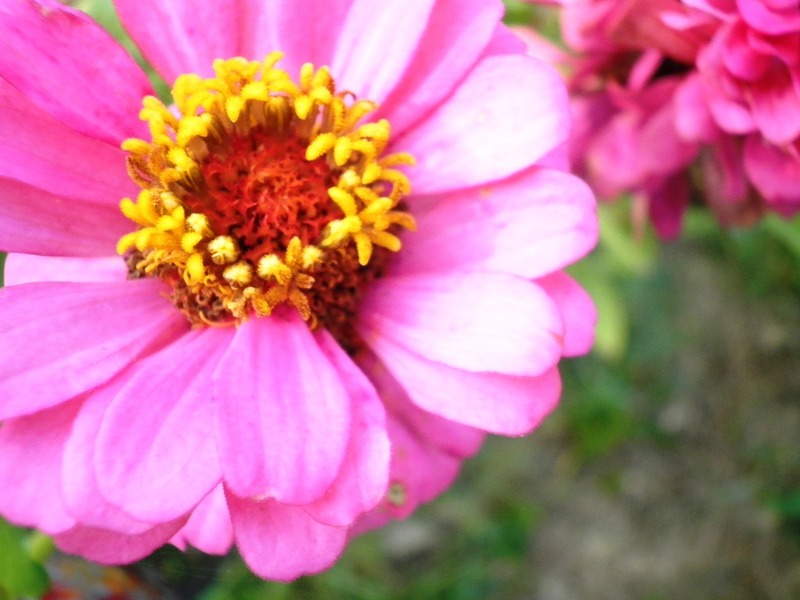 Taking eyebright during allergy season can be great for irritated eyes. Drinking a cup of tea or taking as a tincture has been used for years and can be a tasty alternative to sniffling and wiping your eyes. Mixing it with chamomile can also be calming and a nice addition to the tea. Take it three times a day, once when you wake up, again when around what bothers your sinuses and afterward or at the end of your day. 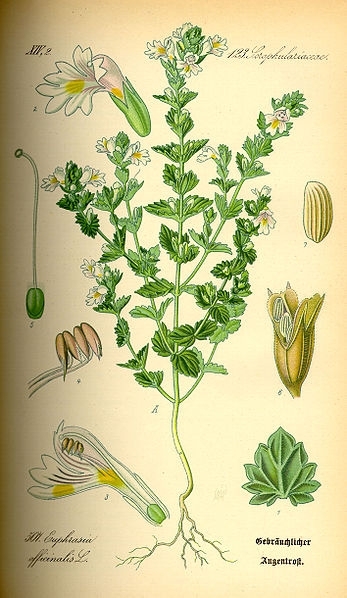 Eyebright may be calming for any lung issues such as bronchitis or a sore throat. It is a wonderful way to get children to drink tea while they are under the weather because it is helpful and tasty. It also pairs well with elderberry syrup on waffles. Other than that eyebright is a beautiful plant that has stunning delicate little flowers. I’m not quite sure why they showed up in my subconscious but I’m glad they did. I cannot wait to see what else it has to show me. Hey - only a few more days of our sale! 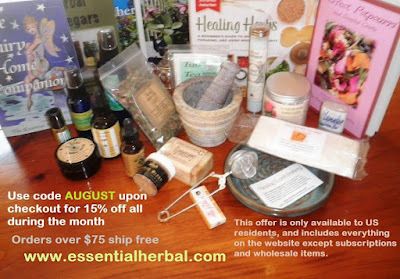 Ends at midnight 8/31/15. Sage was given the distinguished title of "Herb of the Year" in 2001 by the International Herb Association. 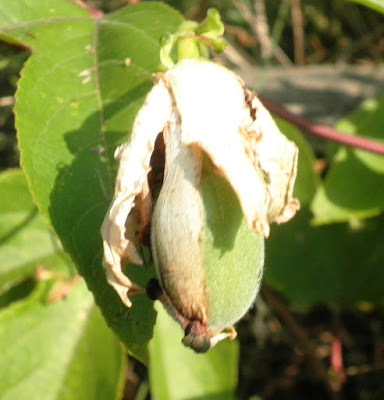 It has a long history of medicinal use recorded back to the ancient Egyptians and Greeks. The colonists considered Sage a valuable remedy for colds and fevers in the harsh New England winters. The Arabs, along with everyone from the Chinese to the Romani, believed that Sage was the key to a long life. Sage is one of those extraordinary, ordinary herbs whose longstanding and familiar use leads us to sometimes underestimate it. 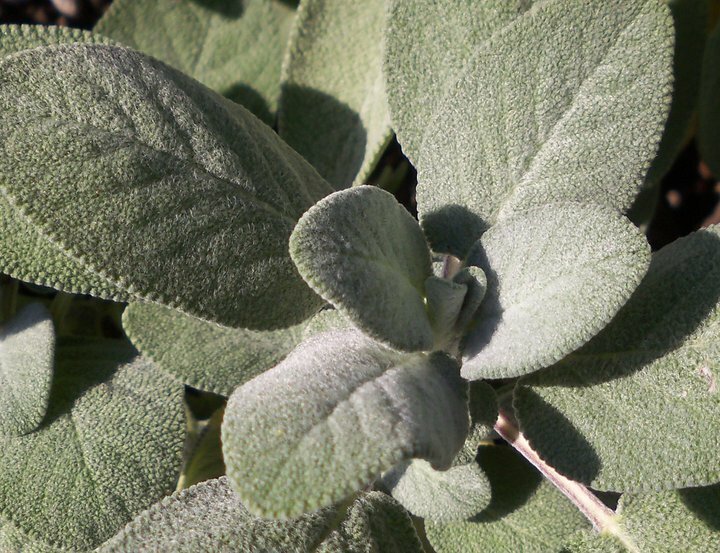 Sage is a relatively small, fast growing shrub, with hairy, green or gray green leaves and a pungent smell. An interesting bonus from the pungent smell is deer don’t like it and that may help keep them out of your garden. Sage (Salvia officinalis) or Spanish Sage (S. lavandulifolia) are two Sage species that have been traditionally used for memory problems. Sage oil and Sage extracts enhanced memory in studies with young and elderly as well, and seeing positive behavioral effects in clinical studies of patients with Attention Disorders. Sage is a commonplace herb used throughout the world for culinary, medicinal and ceremonial purposes. These uses include everything from the mundane to the mystical, from a cure for the common cold to psychoactive effects in ceremonial and religious celebrations. Sage is brought out in the fall to season Thanksgiving dinner. Many cooks use too much Sage, and that may explain its unpopularity with cooks during the rest of the year. 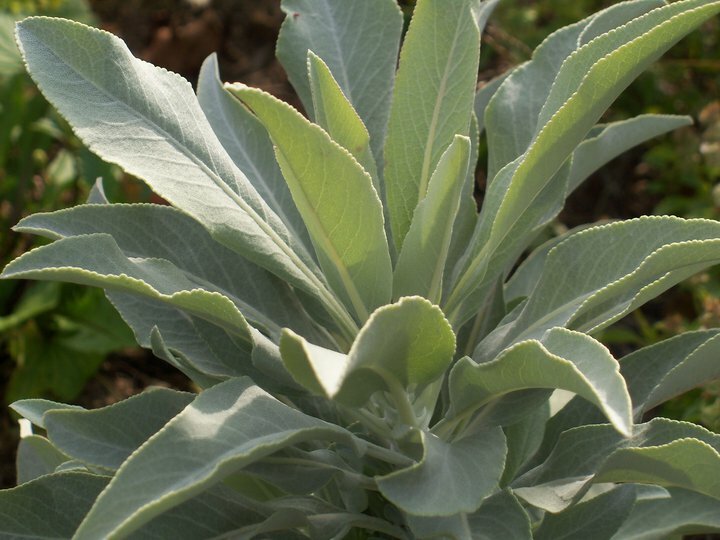 Different opinions persist whether to use fresh or dried Sage in cooking. The overall consensus is “less is more” regardless of which type you use. The tradition of using Sage at Thanksgiving began with the early American colonists. Sage is an excellent digestive herb providing relief from acidity and aids in digesting of fatty and hard to digest foods. 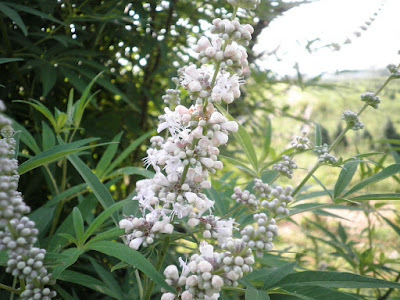 It has been used for colds, fevers, coughs, flu, sore throats, memory enhancement and recall, menstrual regulation, hot flashes, anti-dandruff & hair treatment, heart burn, dyspepsia, bloating, indigestion, insect bites, rashes, skin conditions, as a mild sedative, as an anti-inflammatory and anti-histaminic and to treat many other ailments. You can reduce the symptoms of hot flashes by preparing and drinking Sage tea. There have also been studies using Sage to treat Type 2 Diabetes and Alzheimer’s disease. Sage leaves can be prepared into infusions or decoctions. They can also be made into tinctures, macerated, or otherwise encapsulated and consumed as a food supplement. Sage has excellent antibacterial and astringent properties, which explains it’s popular use in gargles for sore throat, gingivitis and sore gums. A strong Sage tea or tincture diluted with water can be used. 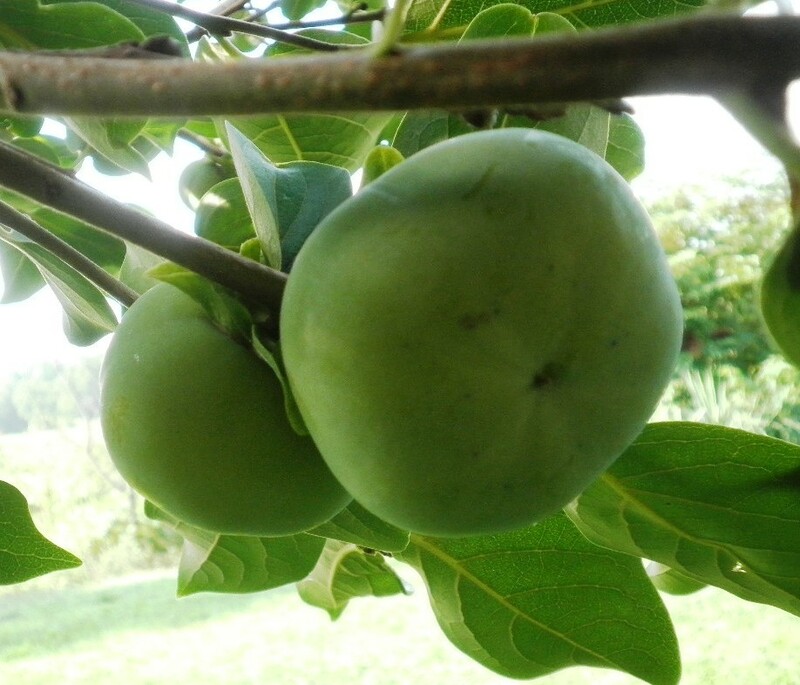 Fresh leaves may be bruised and applied topically to treat insect bites, itchiness, rashes, or any number of skin diseases, while a poultice of its leaves effectively relieves joint pains, cools the body, and alleviates nausea when applied to the forehead. Milder decoctions of Sage tea have sedative properties, but it has also been found to enhance memory and improve mental recall - this is probably the origin of its name! Sage contains the phenolic acid, rosmarinic acid, which is both an antioxidant and an anti-inflammatory which helps in conditions like arthritis. 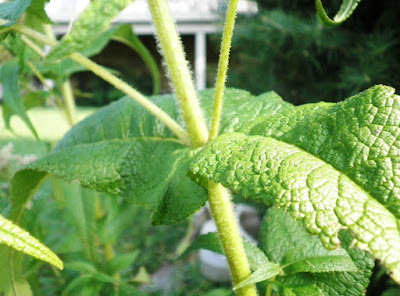 Very potent decoctions of Sage leaves can be used as a disinfectant due to its antimicrobial and antifungal properties, and can be useful in treating and disinfecting both minor and major wounds and injuries. Gypsies used Sage to darken graying hair. It has a subtle, gradual darkening effect that doesn't leave you with ugly gray roots. Sage also leaves hair feeling soft and shiny and the scalp invigorated. Sage does not stop at making you look younger, it can also help prevent those "senior moments" too. Sage is a wonderful herb that is not only good for cooking and alternative medicine but is believed to have great spiritual benefits, too. Throughout the centuries, Sage has been considered a sacred plant. For a number of Native American tribes, Sage is a purifying herb, and is commonly used as a smudge or incense prior to, during, and after ceremonial rituals. The most well known species used for this purpose is White Sage (Salvia Apiana), although all types of true Sage may be effectively substituted. Dried Sage is often burned as an incense in order to obtain insight or guidance from one’s Spirit Guides or Totems. Sage is usually used for wisdom, for protection, cleansing and purification. Sage can be placed in a personal medicine pouch and carried to protect the bearer from all types of physical and spiritual harm. As you can see, there are many, many uses for Sage, and I encourage you to do even more research on this special herb. Always know where your herbs come from or grow and harvest your own. If you are pregnant, always consult your doctor before taking any alternative treatment. 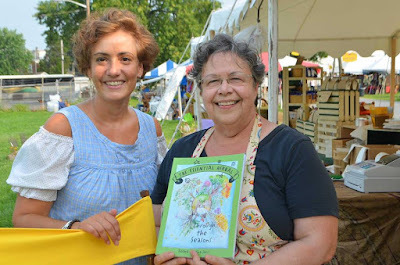 But, most of all, have fun learning about and enjoying herbs! The print copies of the newest issue is in the mail, and the PDF's will go out on the 20th. We LOVE this issue! It's full of really fun information and instructions on the plants that are around us right now! It seems that the only constant is change. Some spooky plant lore for herbies. That beautiful purple in autumn needs to come inside with you. Find out why. Simple ideas to celebrate the season. Complete instructions and information for beautiful (or utilitarian) pillows to improve sleep and dreams. This glowing weed has much healing to offer. A preview of the 2016 Herb of the Year. Such powerful little peppers. Have you carefully dried wild rose petals? Here are some things to do with them. Teas from your yard or from halfway around the globe - something new for everyone! 5 great projects to make now. Make world famous soap in your own home. How’s that for spectacular? We breathe over 23,000 times a day. Read about herbs and techniques to help make it better. The apples are ripe, and cider is showing up everywhere. 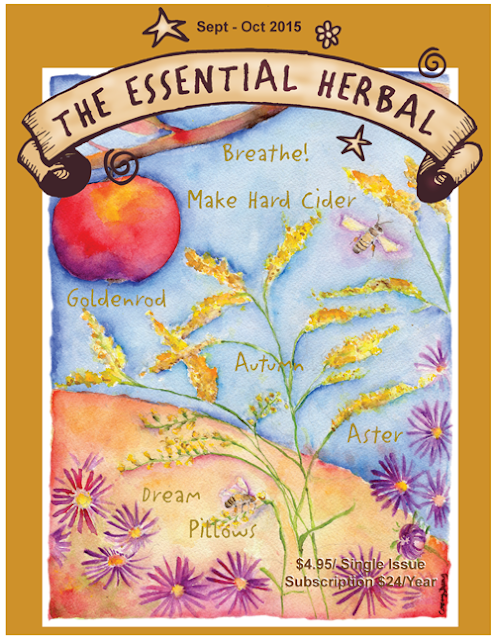 Great instructions for making your own “hard” cider! Cold, dry weather is on the way. These preparations will help your skin survive. It is no exaggeration to say that it has been a very long time since we had time to do things just for the fun of it. There have been deadlines, commitments, external stuff, internal stuff, and all kinds of things holding our noses to the grind stone for way too long. BUT now we get to play. A couple of years ago the witch hazel finally grew more vigorously than the groundhog could manage, and I've been daydreaming about distilling some of it. We'd taken a class with Phyllis Light that inspired us to fill a jar with it, and then cover with wintergreen isopropyl alcohol, and that was really nice - but we have a still, and we have witch hazel. What we don't have is wintergreen. I've planted it 3 times, but so far have not found the place it wants to grow. So I started thinking about other things that might be nice. They wouldn't have the same properties as wintergreen, but maybe we could come up with something like a home made Sea Breeze. A walk around the yard while gathering the witch hazel yielded a lot of great additions. Several sprigs of lavender, a cucumber, some peppermint, mountain mint, thyme, and of course, the witch hazel filled the basket. Normally we don't filled the bioflask more than about half way, but experience has taught us that the cucumber will quickly drop its liquid content into the lower boiling flask. Peeling the witch hazel bark from the twigs was an interesting experience. The skin on my fingers felt a little tight and dry. 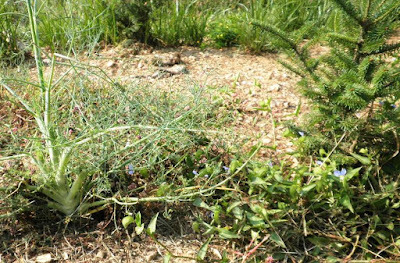 The astringent nature of the plant was easily apparent in the way it felt. The cucumber is a peculiar combination of astringency and soothing. We've made cucumber hydrosol before. In fact, it was one of our first experiments. We didn't know that the cell walls would rupture as soon as the steam hit it, with liquid rushing down into the lower flask - or that it would require the panicked use of a piece of spare tubing to siphon that boiling liquid off... It makes a wonderful, soothing toner. The addition of the mints, lavender, and thyme were mostly for scent. They may also be useful for antibiotic properties and pain (as in a liniment). I used 100 proof vodka to preserve it at 25%. Before adding the alcohol, I tried it on a couple things to see how it worked without having to figure out if it was the hydrosol or the alcohol. It is perfect. Great toning properties, somewhat drying, but soothing at the same time. It can be used for a lot of different things. Any kind of skin problem, like burns, bites, rashes, and even bruising. It's recommended for things like swimmer's ear, where moisture is trapped, so anyplace where skin folds create a problem or even diaper rash. We've very happy with it. I'm not sure I've ever seen people distilling combinations of plant material in one distillation. It's most likely against "the rules" much like we are so often extolled to tincture one herb at a time. We don't follow that same rule when it comes to herb teas, so this seemed like a reasonable experiment. And so it was! Passionflower vine is going places. The scent is intoxicating. Flower seeds we scattered randomly have started to blossom everywhere. The bayberry bushes are loaded! There will be a fair amount of wax this year. Spearmint grows up through one of the bayberries, and the blooms seem to come from within. Hazelnuts are getting their tassels on. The nuts are quite small compared to commercial filberts, but very tasty. Get a load of these pears! The calendula patch is a little straggly. The blooms are picked daily to be used in products. Rose hips are turning bright red. Heavy branches full of nearly ripe apples right outside the workshop door. We might have to use some of them in the hard cider instructions included in the Sept/Oct issue. Lots of grapes on the arbor. Surprise re-bloom of the foxgloves! Transplanted this spring, the foxglove is clearly thrilled with the new location. While my way of starting up isn't for everyone, most of the people I know beginning small, home-based businesses will hopefully find something helpful.